As you are aware, copper coins are being phased out of circulation and will soon be a thing of the past. With millions of copper coins floating around our city and county, this is a great chance for DSI Galway to avail of this once off opportunity to boost our fundraising and put to good use the 1c, 2c & 5c copper coins that are resting in our pockets, in the bottom of our hand bags, the kitchen/bedroom drawer or stored in coffee jars etc…the list is endless! How can you help? 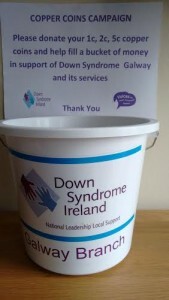 Its very simple…we provide you with a DSI Galway Branch charity bucket/s. Bring the bucket/s to your place of work (with the bosses permission) and ask your work colleagues to help raise a bucket of money by donating their copper coins during November and December (or somewhere you have contact into where you see a viable opportunity to place a bucket or 2). Being the season of good will, the boss may be in a giving mood and with a little encouragement may consider topping up or matching total donations received! If you have contact into or a child attending any of the Secondary school in Galway city and county​, please approach them with the idea of the students and/or TY year of taking on the challenge of filling one of our charity buckets with copper coins between now and Xmas holidays. Schools often support local causes in the run up to Xmas, why not ours? Don’t worry about counting, bagging or banking the coins…we will take care of that.